The Gods of Mount Olympus have turned their backs on humanity. Zeus, King Of Gods and absentee father and husband, has decreed that the age of mortals is to come to its violent end. Poseidon’s seas wash human cities away. Helios’ chariot no longer pulls the sun. There’s a mile-long queue to get into Hades, and there isn’t even a separate line for ticket holders or anything. From this anarchy a soon-to-be legendary mortal warrior rises. With the help of a lone sympathetic Olympian, he will storm Mount Olympus itself, killing its so-called immortal denizens one by one, using their pilfered strengths against one another, and not stopping until even the King Of Gods lies dead at his feet. But enough about God Of War, how’s Apotheon? Based on the uncanny similarities between their premises, comparisons to Sony’s series of god-slaying sprees are probably inevitable, but they’re not actually very useful. 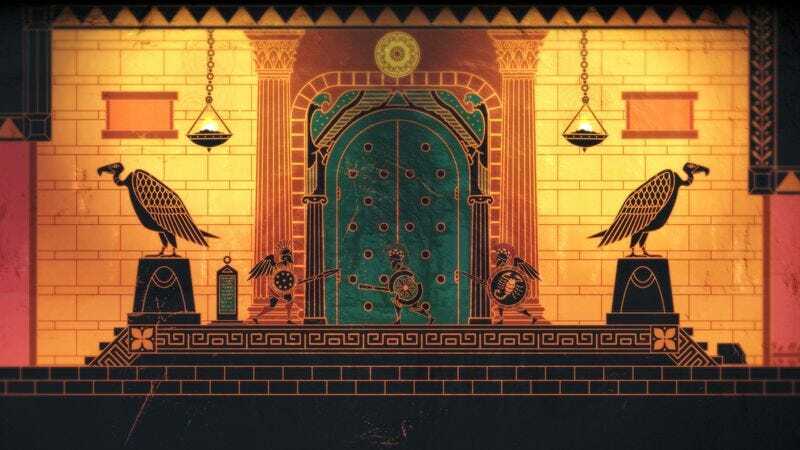 Kratos’ campaign against Olympus was mostly about cathartic brutality (when all you have is blades-on-chains burned permanently onto your arms, everything begins to look like a nail), and the games in which he starred reflected his violent tunnel vision with their focus on combat and straight-ahead levels. Nikandreos, the hero of Apotheon, has a few more strings to his lyre, and his story is more relaxed and freeform as a result. Nikandreos is free to wander around large areas, explore hidden alcoves, collect secret power-ups, and tackle his goals in any order. Completing main story missions—usually by defeating one of the Pantheon—will reward Nikandreos with a new tool or ability that he can use to access areas that were previously out of reach, opening up more secrets and power-ups. Repeat until there are no more Gods to kill or secrets to unlock. These Metroid-style games are usually renowned for the incredible size of their worlds, but Apotheon is refreshingly lean. There are plenty of hidden goodies to discover and optional areas to explore, but very little dead space or padding. Stages tend to be tightly designed and close together, allowing Nikandreos to explore lots of different areas in a small amount of time. When you’re not exploring, you’re fighting. In order to survive his ascent up Mount Olympus, Nikandreos makes use of repairable shields and weapons and various handcrafted potions and grenades. Just about every piece of equipment Nikandreos can use will degrade and eventually break, and different combat scenarios can require wildly different strategies. So becoming familiar with all your tools and remaining flexible in battle is not only the best way to achieve victory, but it’s a great way to keep the constant encounters from growing stale. That’s the good news. The bad news is that combat in Apotheon doesn’t work nearly as well as it ought to. Weapons are swung in wide arcs and only register hits if specific parts of them make contact with their target—only the head of an ax can damage enemies, for example, while the handle will pass through them. This means Nikandreos and his opponent will often be close enough to kiss on the mouth but will both be swinging their weapons harmlessly over each other’s heads. Your view is so far removed from the action, the animations are so stiff, and the characters are so minimally drawn that it’s often difficult to tell what your opponent is trying to do and properly respond to it. The combat comes alive for the man vs. God boss battles, however, which are usually built around some kind of creative gimmick—fighting the giant Poseidon while he knocks your tiny ship around like a rubber duck is a highlight—but the workaday dust-ups feel less like brutal fights to the death and more like slapping action figures together in the bath. Apotheon is attractive, vibrant, and challenging when Nikandreos is scrapping with a deity or exploring Mount Olympus, but it’s dragged down whenever he has to squabble with its innumerable mortal thugs—which is all the time. During his final ascent to the battle with Zeus, the King Of The Gods explains why he has abandoned humanity: They have become poor reflections of the mythical heroes of times past. He declares that, at least for a while, only Gods are fit to live on the Earth, and that mortals deserve death for squandering the goodwill their legendary figures had earned them. For this, he’s cast as Apotheon’s antagonist, but after completing the game, frankly, I think he might have a point.